Today was family sewing day, and both Karen and Pat made incredible progress on their projects. 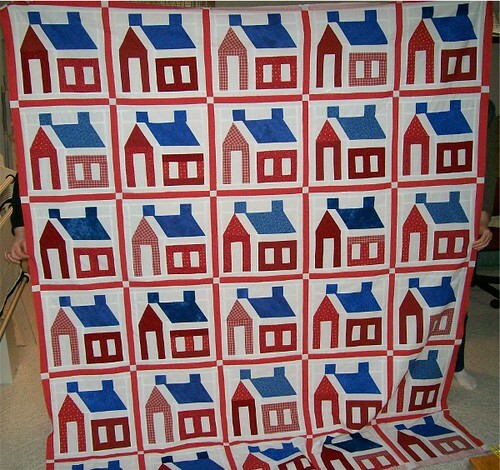 Karen has been working like crazy on a Schoolhouse quilt that her group will raffle next month. We worked on it last week – Karen, Mom and I – and made a lot of progress. Karen continued to assemble the blocks into rows with red sashing and white cornerstones, and today she finished the center of the top. All that’s left is the border, a cute red white and blue print, that I cut for her before she left. Pat handed me a stack of fabrics (the watermelon print, purple, red and dark green) and said, “I want to make something with this.” I showed her my “Easy Quilts” file on EQ6, and she chose the woven rails. We pulled a couple more fabrics (the light green, gold and cream) and I started cutting strips while she sewed. The cream background is 2 1/2″ cut strips, and the centers are 4 1/2″ cut strips. 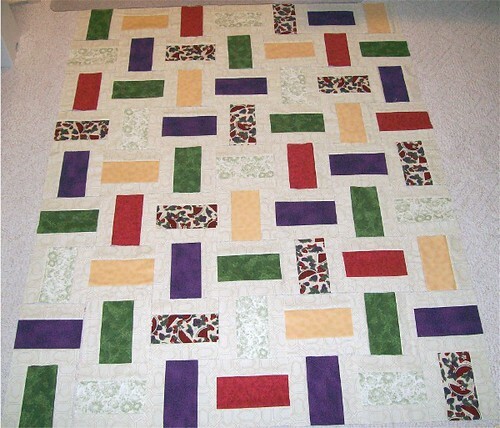 The blocks will finish at 8″, and she’ll add a couple of borders to make a large lap/small twin quilt. It took the two of us about two or three hours to reach the point of finished blocks. She’ll sew the blocks together and bring it back (finished) next month. As for my progress, well, I didn’t actually sew anything. My machine was on, briefly, but I spent my day cutting. Well, cutting, chatting, and eating the awesome Big Crumb Coffeecake with Rhubarb from the Smitten Kitchen blog. By the way, her Blondies are also incredible – I like them with cranberries, white chocolate and pecans. And a little Jim Beam. Ooh rhubarb must be the order of the day!!!! Thanks for confirming that i’m ok ‘yanking’ the rhubarb out, and thanks for stopping by and saying hello. B.x.